I read this book around the same time I read Gritos Silenciosos. Verborgen Tralies is the Dutch title, I actually read it in Spanish, its title is Rejas Ocultas. 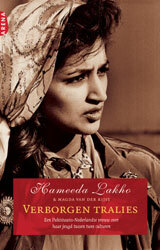 It tells about changes a young Pakistan girl needs to face when she moved in with her father in Holland. This book is about a cultural clash that produces when very young kids (especially women) immigrate from one culture to another totally different from theirs, in this case Pakistan to Holland. It is a very strong story. There was lawsuits between families. I admire Hameeda Lakho in her struggle to become a free woman. It is a non-fiction. I recommend especially if you want to know more about cultural clashes and if you are a non-fiction lover.